One of the reasons I'm excited about this blog is the chance to tell you about books as they appear on my desk, before they're on the bookshelf. Along those lines, Rebecca Ore has just turned in her new novel, TIME'S CHILD. This powerful tale of time-travel, intrigue, history and possibility brings together time-space continuums, Leonardo da Vinci, Vikings, internet hackers, a former camp-follower turned insurgent, and the Knights Templar in one wild ride to determine the future. 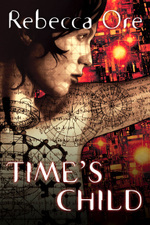 TIME'S CHILD will be available in February 2007.